500 g fresh ripe apricots. First, prepare the filo dough (an almost weightless dough, which is prepared with a little addition of water and butter, without eggs). Sift flour into a bowl. Add baking powder, sugar and salt. Stir well and top the mixture with cut butter pieces. With fingertips, quickly knead the butter into the dry ingredients, while lifting the mass to make it airy and looking like crumbs. Add two yolks, sour cream, and then with cold hands knead all the ingredients making the filo dough. Form a circle from the dough, wrap in a transparent food foil and put in the refrigerator for 45 minutes. Preheat the oven to 200 °C. Butter a deep baking sheet and sprinkle it with flour (remove excess flour). Roll out the cooled dough into a 0.5 cm thick layer, which should be put on a prepared baking sheet. Slightly press the dough with your fingers to the bottom and walls of the baking sheet and then pierce it with forks in several places. Remove excess dough with a rolling pin. The base for the cheesecake is baked in a preheated oven for 10–15 minutes so that it has a light golden brown colour. Cool a little bit the baking sheet with the half-baked base. Reduce the temperature in the oven to 180 °C. 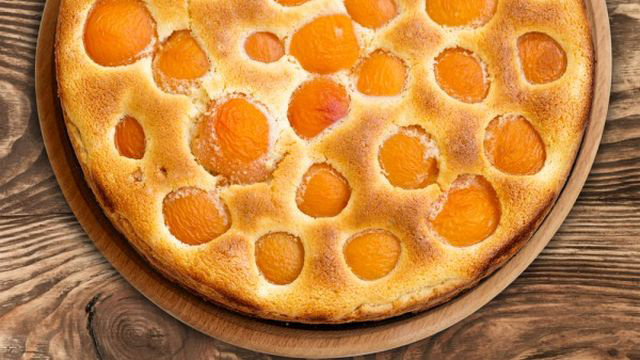 Wash apricots, dry them, remove pits and cut into slices. Take an electric mixer and gently mix cottage cheese, sour cream, sugar, grated lemon zest, cookie crumbs and eggs in a bowl. Pour the prepared mass on a half-baked base for the cheesecake. 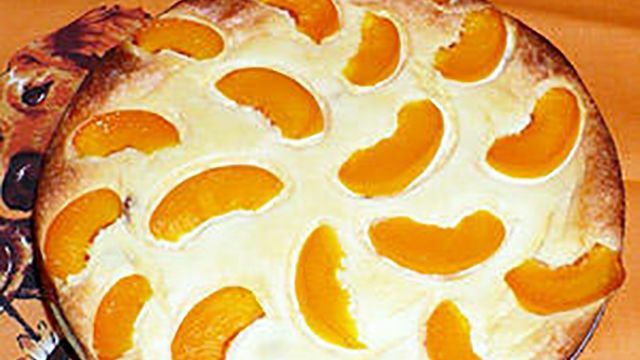 Top the cheesecake randomly with segments of apricots. Bake the cheesecake in a preheated oven for 40 minutes or until the fruits soften and the cheese mixture acquires a golden brown tint. Remove the baked cheesecake from the oven and leave it in the baking sheet placed on a burner to cool down. Take out carefully the cooled cheesecake from the baking sheet, put it on a plate or tray and serve to the table.